working and dog relaxing at the same time! The Inuit Dog has been of great interest to various scientific disciplines from Ken MacRury's masters thesis to physiology, molecular and evolutionary biology and anthropological/social studies. 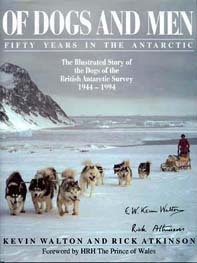 Beginning in the 1940s, many research papers on physiology, nutrition, diseases and performance of British Antarctic Survey (formerly the Falkland Islands Dependencies Survey) husky colonies were published. The study of Inuit Dog DNA has confirmed and proven MacRury's position that the Canadian Inuit Dog is genetically the same as the Greenland Dog. Modern day research physiologists have studied the Inuit Dog's legendary endurance. Evolutionary biologists whose ongoing research seeks to unravel the origins of canid domestication have been eager to study Inuit Dog DNA. Inuit Dogs have also been subject matter for filmmakers. The National Film Board of Canada's collection includes archival material on Inuit life and much of it features Inuit Dogs. Arctic Dog Team (1949), Tuktu and His Eskimo Dogs (1966), Qimmiq: Canada's Arctic Dog (1981) are but a few which contain footage of these primitive aboriginal dogs in their native habitat. 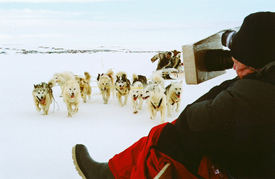 Inuit filmmakers Igloolik Isuma Productions created award-winning films such as Atanarjuat which included scenes of traditional dog team travel. Episode I of their thirteen part series, Nunavut: Our Land, is titled “Qimuksik (Dog Team)” and many other segments of the series include scenes of traditional Inuit Dog use. Dog of the Midnight Sun (originally produced by Summerhill Entertainment of Toronto, 2004) is another. The Last Husky (Aurora Films, 1993) describes the removal of the last of the Antarctic dog teams as a result of the implementation of the Antarctic Treaty banning non-indigenous (except humans) species from the continent. Two documentaries, although not specifically about or built around Inuit Dogs, still do a very credible job placing it in a proper context amongst the world of canids. A Dog's Life (Discovery Communications, 2000) positions this primitive aboriginal yet domestic dog in the more natural world of wild canids with respect to toughness and survivability qualities – untainted unlike more cultured formerly working breeds - in a harsh environment. The Inuit Dog was one of the chosen few represented in Dogs That Changed the World (May, 2007 WNET, U.S. Public Television, series Nature), selected to illustrate the absolutely essential role it played in the success of a culture that for millennia survived in a very hostile environment. Contributions Inuit have given to the world would not have been possible without that partnership with their dog. This documentary also points out that it doesn't take too many generations of inattentive breeding to destroy the original working character of any breed. 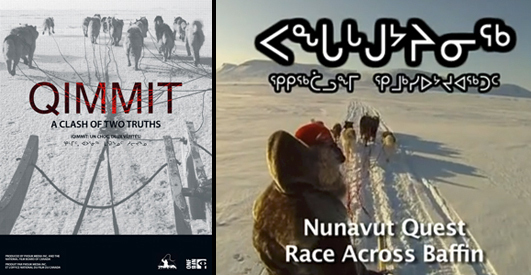 Return of the Qimutsiit (Chinook Communications inc., 2006), Qimmiit: A Clash of Two Truths (Piksuk Media, 2010) and Nunavut Quest (Piksuk Media, 2011) are productions rich with details of the traditional use of Inuit Dogs in the past as well as hopes for the future. They are significant because they are presented from the Inuit perspective. Comprehensive books about Inuit society, culture, traditions and history – and there are many – include descriptives of Inuit Dogs and their use. These volumes vary in content and accuracy, for no matter what their fields of interest (exploration, missionary work, fur trading), the points of view of non-aboriginal authors who may not be fully immersed within Inuit society don't always understand or correctly interpret within an aboriginal context what is observed. It is good to have knowledge of the authors' backgrounds when reading what non-Inuit write. There are books about polar exploration and eco-adventure travel powered by dog team from the 19th century onward which include the behavior and work of the dogs. Not all these draught animals were traditional Inuit Dogs (Ernest Shackleton and Adm. Richard Byrd, USN for example). There is a smaller handful of books written around the use of the Inuit Dog and most, but not all, of these are authored by the brave pioneers of the Golden Age of Antarctic Exploration who have intimate knowledge of their subject matter.